This monograph provides a structure theory for the increasingly important Banach space discovered by B.S. 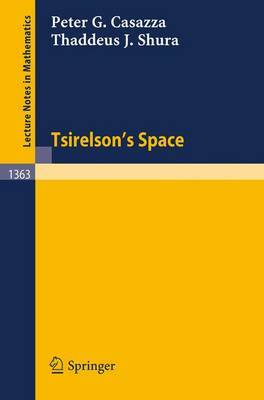 Tsirelson. The basic construction should be accessible to graduate students of functional analysis with a knowledge of the theory of Schauder bases, while topics of a more advanced nature are presented for the specialist. Bounded linear operators are studied through the use of finite-dimensional decompositions, and complemented subspaces are studied at length. A myriad of variant constructions are presented and explored, while open questions are broached in almost every chapter. Two appendices are attached: one dealing with a computer program which computes norms of finitely-supported vectors, while the other surveys recent work on weak Hilbert spaces (where a Tsirelson-type space provides an example).